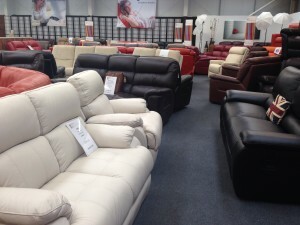 Furnimax furniture Megastore Blackburn Road Accrington is playing host to the largest lazy boy clearance event ever in the UK. Celebrating the release for 2014 of the inspirations range we have been giving huge discounts to our Lancashire Manchester and Yorkshire customers as well as people ordering by phone from all over the UK. Since the introduction of the club leather which is a high-quality thick genuine cowhide leather, in a range of vibrant colours La-Z-Boy has excelled themselves in coming into the new designer style. Now available in the corner group three seaters two seaters and armchairs with recliner and reclining motion both electric powered, and manual. SCS have A range of sofas made by La-Z-Boy especially for them, Furnimax as the clearance warehouse for La-Z-Boy an official clearance partner for reduced low-priced goods like cancelled orders ex-display X sample have some SCS models, for example we have a huge Yorker with drinks holders in beautiful red leather now reduced for the event for just 1999..
A rare opportunity is to acquire our vibrant sun burnt orange corner with electric reclining motion, which is a sample for the inspirations range that did not get selected. This corner group if it would’ve been run as a La-Z-Boy model would have retailed for 3999 you can get it in our huge La-Z-Boy clearance event for just 1999. Another example is this SCS Manhattan three seater and armchair in the chestnut leather with two tone variation this two-piece sofa set is just 1499. Now with the 10 year La-Z-Boy warranty is the Nashville very similar to the Yorker this huge corner suite features electric reclining seats at both ends + three centre seats and a huge corner seat as a bonus it features a storage drinks holder arm and is a full seven seater corner in high-quality black leather reduced from 6034 to just 3499. One of the most famous La-Z boys is the gizmo chill out chair similar to the one featured in friends. The ‘Gizmo Chair’ features fridge, heated massage feature, electric recliner, and the sound system that you can play your own music through. Finished in genuine high quality black cowhide leather the gizmo has now been discontinued from the La-Z-Boy range so Furnimax took the opportunity to buy some of the last remaining ones while they are available and still sell them at a fantastic discounted price down from 1899 to just 1299 no in the box and with the 10 year La-Z-Boy limited warranty. The La-Z-Boy Georgia is one of the most comfortable sofa suites in the world and showcase to order in a range of fabrics in our showroom with both electric, manual reclining motion or static models available. Now for an absolute bargain you to curved corner suite which is a four seater with power recliner at each end from the SCS Augusta range with a matching three seater to give you seven seats in total fantasia if you’ve got a huge room, this is finished in full genuine cowhide semi aniline Bordeaux leather and a one-off deal for the whole lot, clearance price you can quote this article is just 1999. Also you can see the brand-new models like the inspirations range with the new club leather like our La-Z-Boy Zoe in oatmeal cream reduced from 4699 to just 2999 and again complete with a 10 year limited warranty from La-Z-Boy. On display is also the brand-new Tara model from the La-Z-Boy inspirations range. How about a nice fabric suite? We have one of our gallery models to clear which is a La-Z-Boy California three seater with dual action recliner the one with handles and matching two seater all reclining price normally is 2999 just mention this article and it’s yours for just 1999. The La-Z-Boy Georgia is featured in our gallery as a three seater manual recliner with a manual reclining chair and an electrically powered motion recliner chair in beautiful Earth leather which is a lovely taupe colour our reduced price gets you this model with the 10 year La-Z-Boy Limited warranty for just 2699. We are also the factory outlet for Natuzzi, AMORE new trend concepts, and MiZzoni, and have many similar designs to the La-Z-Boy like this Luxus in sunburned orange three seater manual recliner with two electrically powered recliner chair in the highest category 65 leather absolutely stunning and comfortable to sit on for just 1899. The La-Z-Boy cool is part of the SCS La-Z-Boy range our three seater and two armchairs all static are covered in jet black cowhide smooth leather and usually would retail for 3597 however in this clearance event are just 1699 for the entire set which is a one off unbeatable low-priced deal. As well as sofas and corner group or corner sofas we also have individual chairs including the La-Z-Boy rise and recline chair all brand-new and starting at just 699 for a full genuine leather lift and rice chair with electrically powered motion and full lie back recliner action. Or try this X sample La-Z-Boy rocking and recliner chair in fabric which was a considered model for the lazy boy inspirations range that never got selected it would have been 999 but can be yours for just 399 in our huge La-Z-Boy clearance event. Our red Navona three seater and two seater electric reclining sofas set is finished in the Red club leather and just 1899 for the pair. We offer a low-priced delivery service on any of our La-Z-Boy suites whether they are clearance deals for our general low prices to order, we have a special offer cheapest price for delivery going to the following areas at the moment Southport, Formby, St Anne’s, Lytham, Blackpool, poulton, Bispham, Garstang, Carnforth, Lancaster, Morecambe, Haysham, Preston, Kirkham, Birscough, Garstang and the Ribble Valley as well as all of the Lancashire area. Low priced deals are also for Manchester, Yorkshire, Cheshire, Merseyside and Wirral Areas too.